You can book with our dedicated skin cancer GP’s at Robina Town Skin Cancer Clinic or Easy T Skin Cancer Clinic to have a full-body skin cancer check or a particular mole or lesion assessed. Whether you are an existing patient of our practice, or a brand new patient, visiting your experienced local GP for skin checks is a convenient alternative to seeing a dermatologist. Skin cancer diagnosis rates for GP’s and dermatologists are very similar. What is a skin cancer check? During a full-body skin check, the skin is examined from head-to-toe, looking for suspicious lesions. 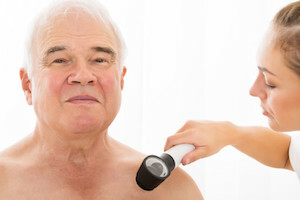 If there is anything on your skin that looks abnormal or irregular, we take a closer look using a dermatoscope, to decide whether further investigation is needed. A dermatoscope can magnify the skin to analyse moles and lesions in much greater detail. While a skin cancer might be visible in the form of an abnormal mole, skin tag or blemish; quite often more can be lurking beneath the skin’s outer layer making it impossible for the human eye to detect without assistance. 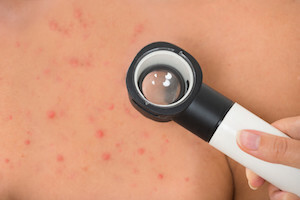 A dermatoscope increases visibility of a mole or lesion by 40x magnification to identify even the most minute areas of concern that can’t be seen by the naked eye. On request, photos of moles and lesions can be taken using a camera and dermatoscope and used to look deep into the many layers of skin. Images are then stored on your clinical record to allow for monitoring over time. This additional level of service allows for future monitoring and assessment of moles. Imaging the mole can help with a clinical diagnosis, although a biopsy may be recommended. During a skin check, patients routinely strip down to underwear to allow the doctor to fully examine the skin. Abnormal moles and lesions can also be found in areas of the skin that are not regularly exposed to the sun and it’s important to let your doctor know if there are any suspicious moles underneath your underwear. Patients may request a nurse chaperone, this means a nurse is present in the room during the skin check. Please contact Reception to request this when you book your appointment. If your last skin check was clear, your doctor will usually request you have your skin examined once per year. If you have previously had a skin cancer, your doctor will probably request to see you more frequently. High risk patients are classified as previously having a skin cancer or melanoma and if you fall into this category your skin should usually be examined every 3-6 months. If you have a spot that has changed or there is something you are concerned about, we suggest you do not wait for the full 12-months and instead book an appointment as soon as possible.